What leads people to a career in science? It’s an important question because the road to a successful career in science – as with technology, engineering and mathematics, the other STEM fields – can be challenging, often requiring a Ph.D. or other postgraduate training. And once in their fields, there can be political and economic pressures with which to contend. The Bureau of Labor Statistics projects workforce shortfalls for many science fields, though the projected needs differ across the life, physical and natural sciences. 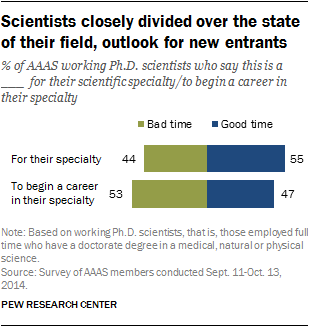 Some 55% of working Ph.D. scientists belonging to the American Association for the Advancement of Science (AAAS) who we surveyed in 2014 said this was generally a good time for their scientific specialty, while 44% said it was a bad time. And while nearly half (47%) said it was a good or very good time to begin a career in their field, 53% said it was a bad time to start out in their field. So, what draws people into these careers? Roughly one-third (32%) of working Ph.D. scientists said a main motivator for their career path was a lifelong interest in science and desire for intellectual challenge, according to the 2014 survey. Many of these scientists reported an interest and curiosity in science or the natural world starting in early childhood. 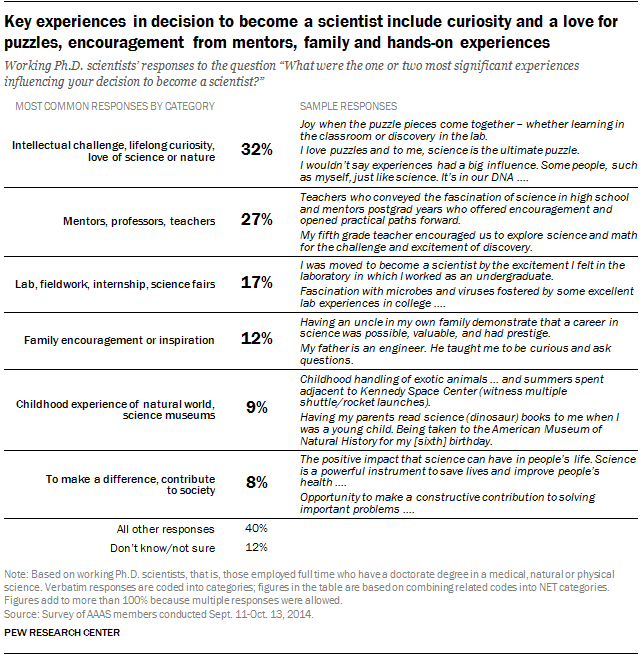 For some 12% their curiosity was fostered by parents and other family members who brought them in contact with scientists and science labs, nature or science and technology museums. Others (27%) remembered effective mentoring and encouragement from teachers whether in elementary school, graduate school or somewhere in between. And some 17% talked about the importance of lab and field work, often at the high school and college levels, which spurred their interest in a science career. Men and women in this group of working Ph.D. scientists mentioned similar kinds of influences on their career choice. Women were slightly more likely than men to say that lab and internship experiences played a significant part in guiding their career path (23% of women scientists vs. 14% of men scientists). And scientists of all ages tend to cite similar kinds of influences. 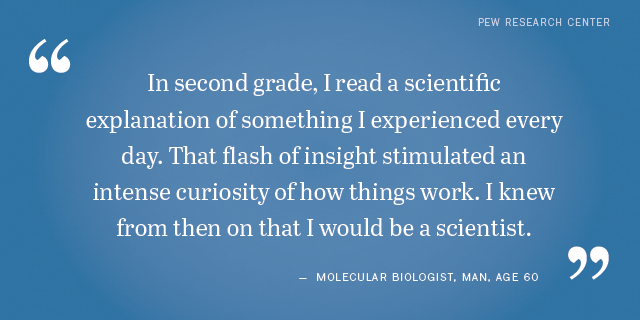 In second grade, I read a scientific explanation of something I experienced every day. That flash of insight stimulated an intense curiosity of how things work. I knew from then on that I would be a scientist. I found science interesting. Growing up, I had a chemistry set and telescope (later building my own), and because of these, read a lot about chemistry and astronomy. My father took me rock collecting and brought chemicals home for me to analyze. Those experiences led to a degree (BS and MS) in Physics and a Ph.D. and career in Geophysics. My father is a physicist. When I was young (I probably was 4 or 5), we would go to his building after dinner and run around the corridors and labs. I remember one of the grad students tipping a [vacuum flask] of [liquid nitrogen] to create a fog cloud – very impressive. My interest in science was first piqued as a seven-year-old observing a full moon through the telescope of a friend. A couple of years later, my interest in space and the possibility of space exploration was promoted by the start of the manned launches into space in the early 1960s, and in a written essay in fourth or fifth grade I even expressed interest in science as one of three possible career paths …. My entire childhood was steeped in experiences in the natural world and in scientific observation/experimentation. Both my parents are scientists. One memory that stands out in particular is of a canoe trip to the boundary waters in northern Minnesota when I was about 12, where I saw carnivorous plants in the wild for the first time – beautiful, huge, floating mats of pitcher plants …. While many scientists mentioned childhood experiences facilitated by their families, some 6% said science media was particularly influential in their career path. These scientists mentioned a range of media including books such as Microbe Hunters; magazines such as National Geographic and Scientific American; TV programming on PBS and commercial stations such as NOVA, Carl Sagan’s Cosmos, Mr. Wizard and Bill Nye the Science Guy. When I was a child, my exposure through media of what science was and what scientists did influenced my career decisions. My grade school education in science was very poor, which increased the importance of the media exposure.